What is Qooh.me? Your tweens and teens are all over it! Yet another social media site that our teens and tweens are flocking to and one which parents need to know about. Qooh.me allows users to ask one another questions anonymously. Think about that? Vincent Mabuza, left is the founder. The site was launched four months ago in May, and after a slow start with only 8,000 users in July there has suddenly been an explosion to more than 170 000! It is reminder of the worst of Formspring.me. Naturally I signed up. It is the only way to find out about these sites. It was very, very easy. Frighteningly so. In fact the site brags that it only takes ’45 seconds’ to sign up. There is no age restriction. No privacy settings! I simply had to create a user name and a password, add my email address and I was in. Immediately I had 3 questions asked of me from random anonymous people and they were not nice – I could not and would not reprint them here, or anywhere for that matter. Children, tweens and teens can interact with adults with no indication as to who is who and more disturbingly vice versa.. You can add a photo but who knows if it is you or not. The site provides protection for teens to ask each other anonymous questions! You can only imagine where this can lead. This entry was posted in Cyber Bullying, Cyber Safety, cyberbullying, cybersafety, Dangers, Internet safety, Social Media and tagged Cyberbullying, Cybersafety, danger, Digital Reputation, harrassment, Qoohme, social media, social networking, Teens, Tweens. Bookmark the permalink. 15 Responses to What is Qooh.me? Your tweens and teens are all over it! 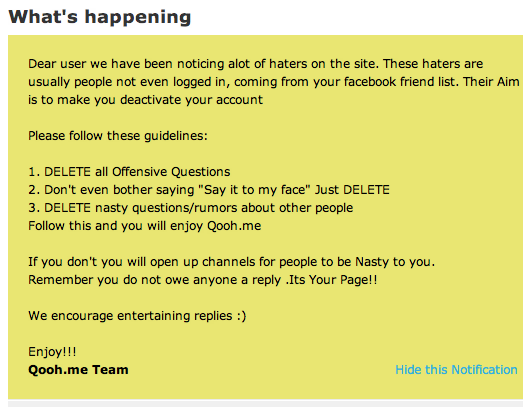 It’s like the site was made by a 12 year old… The grammar and wording in the message from the site are terrible. I have noticed a lot of horrible things show up on my qoohme dashboard and even though they aren’t stopping these malicious questions at least they are replacing swear words with astrixes… The site is problematic, and I would leave but I don’t get enough questions myself for it to bother me overly much. Your thoughts about qooh me are wrong. Qooh me is a website where people are free to ask questions they never could. They ask 3 automatic offensive questions because they want to test if you would response to offensive questions. Next time you write about qooh me get your facts straight and interview people. Everyone enjoys qooh me. Hope to read an article that has good stuff about qooh me!!! Thanks for your comments Ruth. I am glad you like the site and find some point in it. I can only say that teenagers in general do not tend to use it in the way you do. Rather in my experience I have seen it used to belittle, taunt, tease and hurt. Qoohme is for people who are too scared to ask questions straight to your face. I totally agree with Ruth. This website is just another cover for gutless bullies to post rubbish. I have just stumbled across messages sent to my daughter and they are hateful and the disturbed kids (you know who you are in eltham and heidelberg) sending them have been given yet another free tool to spread cowardly rubbish about anyone with no consequences, you mare all sad. So sad to hear this Sanny. I hope your daughter can rise above them and it sounds like to me with your help and support she will. These sites do allow people to hide behind fences I am afraid…it is a nasty business. The best thing your daughter can do is to get off the site herself so that she is not providing them with an audience. If it gets too hard, you can always contact the police as they can trace IP addresses in serious cases. This article is incorrect. You state that “I simply had to create a user name and a password, add my email address and I was in. Immediately I had 3 questions asked of me from random anonymous people and they were not nice – I could not and would not reprint them here, or anywhere for that matter.” The 3 you received were automatic standard questions. Qoohme has these to see if you would delete them or respond, and to get you started. How did you think you would have 3 questions before 1 second in? Next time research a little bit more before you write an article on a trustworthy website. Thank you for explaining that the 3 questions were automatic. That is helpful to my understanding of the site. It does not however validate the website for me or make it ‘trustworthy’. At least one of the 3 questions was offensive and inappropriate. The offensiveness of one of these questions in particular, and you will be aware of the one I am speaking of if you also received them, sets an especially distasteful tone for the site. It is also a site that invites users to ask questions anonymously and therefore provides a protective platform for malicious questions and statements. The site does not seem to respond if a comment is reported and does not take down or intervene in the cyberbullying or trolling that I have witnessed my students experiencing.